← The Words Must Flow! This warrants some kind of intro. If you’ve read some of my other posts, you may know that I’m a dad with 3 boys- ages 13, 5, and 3. I’m very close to my dad. He is definitely a standard against which I measure myself as a man, a husband, and a father. I’ve had some missteps and false starts but the one consistent driver in my life has been this- “I want to be a good dad.” This is something that matters to me. I love all 3 of my boys- nothing special there. That [should be] the basic expectation for any dad- love your kids. That is an important motivator for me. I make the best decision that I can then worry whether it’s good enough. My 3 boys are different as can be- all 3 of them. My 13 year old is from a prior marriage while the youngest two are the children of my wife and me. Watching them, I see the differences and uniqueness of each one. I think that giving them space to figure out who THEY are is an important aspect of my job as their dad. I think that the real test for your convictions is the moment at which your convictions tell you to do something that is tough. It’s easy to “be supportive” when you’re reinforcing the need for a kid to apply him or her self in school. But the last year has been a true test in my belief that I need to support my sons in figuring out who they are. Which brings me back to the opening sentence of this post- my boy likes dolls. In truth, it’s much more than that. My little guy, sometimes nicknamed the Goon, likes everything that you’d typically associate with a little girl. Dolls- check. Favorite color: pink- check. “I’m going to grow up to be a Mommy”- check. Best friends at school: all girls- check. I figure these could be leading indicators that my youngest son could be gay. Ironically, the little guy wants to wear pink AND is our little bruiser. (Hence, the “Goon”.) His 5 year old brother, AKA Noodle, seems more delicate. Noodle does not handle skinned knees all that well. Although Noodle takes karate and plays with all of the “boy” toys, Goon is the tough guy. Somehow, this doesn’t seem incongruous when you watch the Goon or talk to him. It all comes together perfectly in our little guy. BUT- it’s altogether an entirely different question when your 3 year old identifies himself with every aspect that our society would label as “girl”. Now how dedicated are you to living your beliefs? You want to support your son when he just wants to be the “girl”? Well, there’s the test, isn’t it? Although this has been building over the last year, my wife and I were stopped dead in our tracks this week when my wife went to buy the little guys new sneakers. Noodle picked out some cool racing car- or rocket-looking ones. The Goon, though, only wanted girl sneakers. 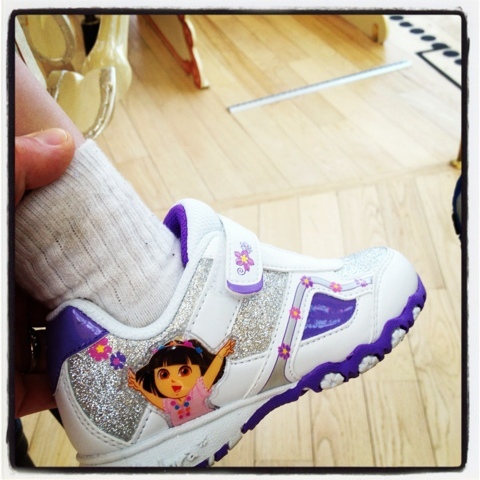 He landed on a beautiful pair of purple-and-sparkly girl sneakers. To be fair, he didn’t exactly surprise us. As long as he’s been able to articulate a preference, he’s chosen the “girl” stuff. I could list a dozen exhaustive examples but the Noodle actually summed it up best in the type of cutting wisdom that only a 5 year old can demonstrate: as I was getting the 2 little guys set up in a video game and trying to steer Goon to a more traditional “boy” character, Noodle turned to me and exasperatedly stated, “He just wants to be the girl. Just let him.” The Goon’s choice wasn’t a big deal to Noodle- why was it a big deal to me? Why was it a big deal to me? Fair question. As a dad, shouldn’t I encourage only those masculine ideals? Isn’t that part of the job? Well, here I am declaring where I stand- No, it’s not. The Goon is going to be the person that resonates with him. He has to follow those beliefs and ideals that speak to him. If he can articulate a preference at 3, so be it. Whether that means football or ballet (or both), so be it. I love my son and want him to be who HE is, not what I think society says he needs to be. I recognize that this is a controversial topic. Really, I’m skating along the edges of a polarizing discussion. Do I think my son could be gay? If so, what should I do about it? Maybe. He certainly identifies very strongly with the feminine role in everything. I need to support him. The world will be tough enough without his family’s clearly demonstrated love. There are a few watershed moments for me as a dad. I count one of them as a couple of weeks ago, in the beautiful weather and prior to “The Sneaker Incident”, the little boys were riding their new scooters in the driveway. My wife had taken the boys to Target to silence the repetitive cries for scooters. She’d allowed the Noodle and the Goon to pick out their own scooters and sets of protective gear- gloves, elbow pads, and knee pads. (We had numerous helmets floating around from their 13 year old brother.) Noodle had picked out a Transformers set. Predictably, Goon picked a pink-themed Ed Hardy-type of tattoo design that would look OK on a 10 year old girl. Also, the Goon had a beautiful new pink scooter on which to speed around. It was that moment- as I was kneeling in our garage- that I count among my most proud moments as a dad. As I was strapping Goon into his pink knee pads, I looked up at him. Turning to his older brother, the Noodle, I shared with him what he was going to hear. I’ve made plenty of mistakes in my 41 years. I’ve been married 3 times. I’ve said things that I wish I could take back. I’ve followed the crowd and looked back with regret because I didn’t have the courage to say, “This is wrong.” But that moment, in the bright sunlight spilling into my garage, I’m proud of the lesson I shared with my two youngest sons. To write about it now brings honest tears to my eyes. By way of disclosure, I admit that I have bias in the whole “Nature vs. Nurture” argument. I have many family members that are gay. I have dear friends that are gay. I love all of them and stand staunchly by them against anyone that would condemn them merely based on how they identify themselves. Again, I recognize that this is a polarizing topic. My boys have someone that loves them dearly that identifies with beliefs typically associated with those of evangelical Christians. Out of fairness, I will identify that person only as X. X truly and sincerely believes that being “gay” is an offense in God’s eyes. I don’t think that X is motivated by anything other than sincere belief. Nevertheless, I believe that X is wrong. Goon has identified with the things that speak to him. Who am I to second-guess him? As a 3 year old, you could make the argument that he has the purity of youth. Goon has no agenda. He has no politics. He is merely being himself. If you believe in God, you should count on His omniscience and omnipotence to render any judgment that He deems necessary. Relax- He’s got it. One could argue that Jesus’s message was, “Love one another.” Focus on that. And so- I say this: I love all of my sons. If the Goon is gay, or if he is transgender (because he increasingly says, “I want to be the GIRL”), then I will be sad. Not as any kind of condemnation. Merely the sadness of a parent that doesn’t want their child to face the cruel reality of our world. Nevertheless, I can’t shield the Goon from the ugliness of the world. I would hope that he is gay and not transgender because, with so many gay family and friends, I see how difficult being gay can be. I can’t imagine how difficult it must be to be transgender. I recognize that the worst thing I can teach my son is that he must hide who he is. I will never do that to my son. In recognition of the great void that is the Internet, this post will come down the moment that the Goon is ashamed by it. Everyone else will need to abide. To anyone on the fence, I say this: as a parent, it is not your job to protect your children from the ugliness of the world. (Because-DUH- you can’t.) All you can do is make them secure in the belief that being WHO THEY ARE is OK. This counts. And it’s the most important job that you’ll have as a parent. I applaud you for expressing your concerns and your acceptance. Our world is so splintered today. Black/white, muslim/jewish, gay/straight,rich/poor,rebublican/democrat. My son is now almost 22. Although he was not into pink..he was always very sensitive,a writer and a musician and did not like sports. I am not sure he has figured out his sexual preferences. He tells me that it is the person not the gender. He once asked me if a girl was bisexual would she be more likely to cheat. I told him a person is a person and they have their own values. Not because of gender or sexual preference.I love him for who he is, everyone who meets him adores him,has traveled all over Europe and is currently living in Istanbul and going to University there. The kids are the same there as here so culture does not play a part in it.I am so proud of him,he is so confident and is not afraid to take a risk. Independent,caring,sensitive,that is what matters most. My message is,it does not really matter whether he marries a man or woman. As long as he is happy.And your little guy is not afraid to be himself. i hope he hangs on to that! ….that’s it, right? Just love him as he is! What a wonderful post. I am gay myself and live in another state separate from my parents and family. I love my family, but I didn’t have the kind of Father that you are to your sons. It is absolutely refreshing to read your post and realize that there are good people like you in the world. More importantly there are good Fathers that don’t beat you with belts and pvc pipes when you make a simple mistake as a child like my Father did to me. I know it sounds like I’m bitter, but while I love my Father, I have to practice what I preach and accept him for who he is, unlike he does to me. It gives me hope to read your post and lets me know as an abused child with a still alcoholic Father, that maybe, just maybe one day he will love me for who I am and not for what he thinks I should be. Thank you so much for your post and your love of your sons. You are an inspiration to me and I’m sure to everyone who reads what you have written about your family. Wow- that is hard to read. I admire your courage in continuing to hope. It sounds like you’re doing a great job. Who can say whether it’s a phase he’ll grow out of, or his true self that he’s discovering and identifying at such an early age…? either way, I think you and your wife are doing a wonderful thing. If you find that he continues to be into pink, girly & princess-y stuff, please know that you, your wife & your family are not alone. There are great resources out there, and people who are documenting their experiences too. Check out the blog “my princess boy”… Also a friend has a great clothing company — Handsome in Pink — that she started when her son wanted pink clothes with “cool” stuff on them; they are for anyone who wants to send a message that boys who wear pink are OK, just as girls who want to play with trucks & tools are, too. I know that it isn’t easy, but sending those messages of acceptance & support to our tiny kids now (as you’re doing) is the best way to help build a more compassionate, loving, hate-free world. Thanks- I will check out the blog! All I have to say is that you are an awesome dad and your sons and wife are very very lucky people!!! Thank you for being a stellar parent. Parents like you make the world better–not only for your kids–but for *my* kids, and others’ kids, and society as a whole. Now is when we particularly need folks like you. Great post. Thanks for being so honest. Have you seen this article from the Boston Globe? http://articles.boston.com/2011-12-11/lifestyle/30512365_1_twin-boys-transgender-jonas When I first read it I cried, knowing that there are people out there who are willing to go out on a limb. As a parent, I know that I would do no less, either. Kudos to you. Thank you for reading my post. I haven’t seen that article but will check it out- thanks! As I read your words tears are rolling down my cheeks. I dont think I have ever been prouder of you. You have turned into such a beautiful man. Really Todd , I mean that from thew bottom of my heart. Your acceptance of your sons is a thing of beauty.I firmly believe that if my brothers had even one parent like you they would be alive today. Your boys are very blessed to have you and Aubry on there side. With the true love of a parent a child can become who they were meant to be. Without it pain and heartache will follow them all there lives. Whoever your boys become they will know they can always come home to Mom and Dad for love and support. Maybe just for a laugh. I to think you had a great teacher in Papa. Rejoice for your sons are still babies and you are ready for whatever life brings your way. Believe me, I was thinking about Uncle David and Uncle Ray when I wrote that. I wish they were here today with us. Todd, you are the best.I have never been prouder of you. You are such an inspiration! I loved reading this and will continue to share with friends and family. My hope is that the world could be just as accepting as you are. My partner and I have a 5 year old boy who loves princesses, the color pink, always plays with girls at school, chooses pajamas that are clearly designed for girls, etc. I am one hundred percent okay and comfortable with his choices and support who he is and the path he may be on. I love him! He is my son! His mamas are lesbians, so of course I will always stand by his side on this journey that is his life, because if he is gay as I believe he may be, I don’t want him to have the difficult path and acceptance of himself that I did. I never ever want him to be anyone but who he is! And my hope is that our family would see it that way too! Of course they love him, that is clear and well known, but when it comes to Asher picking something that is out of the normal choice for boys, family has been known to question his choice and of course ours as parents. They only want to protect him, they have said that, but sometimes I get the feeling that they want me as a parent to steer him away from those “girl” things. I won’t do that, I will however inform him of the same things you did for your sons. That others may say things or not be accepting, but he needs to be who he is. And I believe that my job as his parent is not to protect him from the world, but to just love him, support him, and help him grow to be WHO HE IS. I WILL NEVER STAND BY QUIETLY IF OTHERS WANT HIM TO BE SOMETHING HE IS NOT, I WILL NOT MOLD HIM OR STEER HIM AWAY FROM HIS CHOICES. I love my son for exactly who he is and what he will become!! Thank you so much for sharing this story, I can not tell you how happy I am that you have written it and shared it with the world. So beautifully written; I can tell it’s from your heart. Regardless how your kids “turn out,” it’s beautiful to see the lessons you personally have experienced. The worse thing, I think, anyone can do is deny the true self. Thank you for teaching your sons that. Be sure to tell them again and again as they grow, since they are so young. It’s a lesson I’m still trying to teach myself, as I’ve come to realize that most of my life I’ve tried to be someone else. And all just to please others. It just doesn’t work. First off, thank you for following my blog. I have few followers so to get a couple makes me feel great about my writing and that it really can mean something. I don’t know much on the topic above, but I applaud you for taking the time to write such a wonderful post. I know over the past few years there have been some that have gotten national attention and were over the top for no reason. Your post is the first I have read on the topic that truly seems legitimate and thats what makes it so wonderful. Hope to read more in the future. Thank you again. I really appreciate you reading and taking the time to comment- thank you! I’m a grandparent that was referred to in a post. Kim was correct when she said we spoke out of concern for our grandson’s future in the mean world. So I bought him defiantly “boy” pjs. He doesn’t wear them. After she respectfully but firmly told us to back off, we have. He loves pink; he loves princesses, and he seems happy enough being a boy…who loves princesses. He revels in the love and acceptance of his family. Let him wear what he wants. The world will judge him soon enough. It’s not my job to judge or parent. Just accept and support….so I will. I am grateful that you shared that- thank you! I was THAT little boy-what a beautifully written post-I would have probably grown up with more self-confidence and been a better person if I would have had parents like you-it was hard enough to think you are the only person in the world that feels like you do-THANK GOD for my sister- she was my rock-I am now 49 and have a partner of 17 years-I choose not to put myself around people who do not understand that it is not a choice-I was born this way-thank you again-what an inspiration you are for all mankind. Thanks for the validation and thank you for sharing! I have to say I did a double take when I saw your name. Here’s why: I have 2 adult sons. The oldest (O) is fairly popular, athletic & muscular, football player & class clown-type. He could schmooze his teachers when he didn’t complete homework and his handsome features often were acknowledged by many. My youngest (Y) was described by a guidance counselor as “painfully shy”. Though he is just as handsome as his brother, he was often either ignored by peers/teachers or he was bullied by both. When younger he had a slight build (he is still extremely thin, though tall). He had cupid’s curls which are now shorn because he looks more masculine and it keeps old women from grabbing his curls! He was subjected to nearly 8 years of abuse in a Connecticut public school by both students and teachers to the point we had to seek legal action (which we won on principle). Anyway, there was a day (Friday the 13th of December) during his 8th grade year when a bully picked on my son calling him a “fag” and a “queer”. (My son didn’t wear pink or sparkles ever and to be honest never wanted to.) My son was judged because he was a loner (with trust issues that are justified but that’s another story) and very tiny. My son finally replied to this bully in the lunchroom, “That’s right. I must be gay and you detected it with your ‘gaydar’.” This turned the tables on the bully because others laughed. My son was then threatened in the cafeteria in front of students, teachers and administrators/staff. At recess my son was beaten up by the bully and 3 friends; as punches and kicks struck my son other students asked teachers and aides to help my son. These actions were ignored. My son was left on the cold ground curled tightly in pain and students were told to leave him alone while the 5th-8th graders returned with the faculty into the school. Minutes later a 6th grader came to his aid and helped him to the nurse. I wasn’t called to the school until 3+ hours later and no adult would speak with me. My son had a black eye, swollen nose, cut lip, a bump on the head and bruised ribs. I ended up dismissing my son and got reprimanded for doing so until I told them I was filing assault charges. I brought my son to his doctor who sent him to an emergency room. The physical injuries paled in comparison to the psychological ones. My son was now on a suicide watch; so numb he couldn’t speak. (Move forward past the physical wounds, the psychological care, the legal issues & residual affects on him as a youth and now young man; the reason I was shocked by your name was because the school’s vice principal was “Mr. Panek”. When I returned home from the hospital with my son on Saturday the 14th of December there was a message waiting on my answering machine that I have kept for a full decade. This poor excuse for a man (and child advocate as our teachers and administrators are supposed to be) left a message telling me (without apology) that he wanted me to know this this wasn’t “JUST a case of gay-bashing”! Needless to say I was in his office before he arrived to school that Monday morning. I asked him if he could justify it being okay to “bash” my son if he was gay, informing him (among other things) that there is no such thing as “JUST” a case of gay-bashing. It is good to know that there is a “good Mr. Panek” out there who does advocate for his son regardless of what his sexual preference turns out to be and, thus, advocates for other kids struggling with issues of sexuality and preferences that go against the grain of society. Thank you. Finally, both my sons have been in long term relationships with girls only. Neither son is gay, but if one of them was I would defend him and his decisions. I am a Catholic who believes the message of “Love one another” to be just that Love for All (at the same time I’m don’t favor extreme PDA of any couple but don’t deny signs of affection in any couple either.) I also believe “He who is without sin should cast the first stone” and that ultimately there is 1 judge of all of us and that is God — not those who want pretend they’re him. “Y” continues to be extremely shy, yet amazing – like his brother. TMPinSYR, I am about to be a father for the first time. I’m a bit older than most first time dads, so I like to think I’ve had time to develop my own wisdom before trying to pass wisdom on to my kids. I repeatedly find myself convicted that my job as a dad is going to be what you wrote here…enable her to grow up to be HER. I can’t wait to meet her and get to know her! Thank you for your beautiful post and encouragement! Thank you for sharing your families story. It is wonderful to read something positive on the internet. Parenting is a difficult all consuming life but it is also the most rewarding thing most people do. People show you who they are early in life,most of us feel the need to ‘fix’ or ‘help’ them. Instead we need to accept and love and trust they will follow their hearts-wherever that may lead. I would say your Sunday afternoon talk with Goon and Noodle will resonate with them throughout their lives. To understand, that even at their young ages, that they need the assurances that they are loved, is a wonderful message. Good job, DAD. After going through some of the posts with your website now, I truly much like your means of writing. I bookmarked it to my list and will be checking back soon. Do take a look at my internet site and make me aware of what you believe. You are an exemplary parent. I hope more and more people begin living by your actions. I am happy to know that there are parents there that tell their children it is ok to be who they are and support them. I was the girl who liked boy’s things, hated dresses that I was “forced” to wear and was never into the whole pink girly thing. My mom (dad was out of the picture) wouldn’t or couldn’t accept that. I would ask for matchbox cars and trucks for Christmas and get dolls. I promptly took the barbies and cut all of their hair off. I was taught that it was not ok to be me and that something was wrong with me. Now at age 42 I still feel sometimes that she was right, there is something wrong with me. Thank God for therapy. Thank you for being such an open and caring Dad, it will make life so much better for your son knowing he is ok and he isn’t alone..
I’m so sorry that was your experience. I hope that my children will never have a similar one. I do appreciate you reading and commenting! This is awesome. My youngest son loves dolls, pink, Dora, anything and everything that this society identifies as “girly.” Instead of saying that he likes girl things, however, I just say that he likes toys. I am so sick of society placing labels on stuff and limitations on our kids, saying that just because you are one gender, you are not allowed to like something or another. My son plays with dolls, and I know he is growing up to be a nurturing dad some day. He likes pink, and he will grow up to appreciate beauty. I will never tell my daughter that she can’t be whatever she sets her mind to because she is a mere girl, and I’m certainly not going to place limits on my sons, either. The funny thing is, in the 1930’s and before, pink was a baby boy color. Red was seen as masculine and powerful, and blue as calmer and more demure. So pink was for baby boys, and blue for baby girls. That all changed when Hitler started his concentration camps, and labeled homosexuals with a pink triangle, so pink became known as a feminine color. As far as I am concerned, if we say pink is only for girls, Hitler wins. Seriously though, thanks for reading and sharing your experiences!